It’s been a long and hot summer. Still a lot of you found some time to code. Here’s an overview of your best pictures. In Vilvoorde, they learned how to code a drone using a microbit. Coding with an altitude. Coding outside at Anderlecht this summer with coach ‘JB’ teaching these youngsters some Scratch. Thanks to CoderDojo powered by Cultureghem. 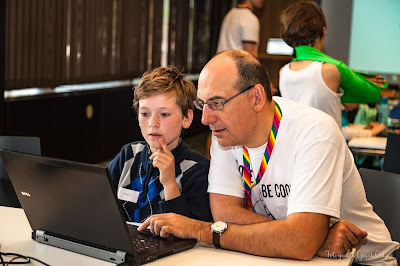 In Lier, they had a CoderDojo national. Coding on our national holiday: voor vorst, voor vrijheid en voor recht! Some coding enthusiast gathered in RSL De Post in Roeselare for a Raspberry Pi Jam. Young and old teaching eachother. With some help from our friends at CoderDojo Izegem.